The State of Texas HB432 requires all State Agencies (including UT ) to procure alternative fueled vehicles, and to use alternative fuels whenever available. The University complies by providing, diesel, biodiesel, ethanol (E85), propane, along with regular unleaded gasoline at the UT fueling stations. Self-service fueling is available 24 hours a day, 7 days a week, to all State Agencies. At Manor Rd. hoses 1-4 are for unleaded gasoline only, hoses 5 & 6 are E85, hoses 7-8 are biodiesel (B5), and hose 9 is for propane. 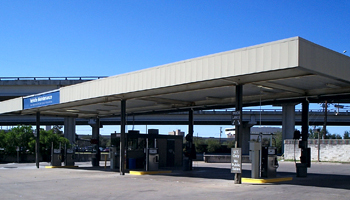 If you are in Travis County, you must use one of the university fuel stations. The university has fuel stations at the Pickle Research Campus (Bldg SV1) and on main campus at Manor Rd and IH-35 (Bldg FC7). Special Prokees are required to use these stations and are available at the automotive shops. The Prokee will allow only specific fuel types, and are tied to a specific vehicle. Each vehicle will have a unique Prokee which should be used only for that vehicle. Prokees can also be programmed for "other" equipment such as lawn mowers, carts, generators, etc. When traveling outside of Travis County, a State issued retail fuel card should be used to purchased fuel. The state Council on Competitive Government awarded the state contract for all retail fuel card purchases to US Bank – Voyager. All state agencies and institutions are required to use this card exclusively for any commercial fuel purchases. Most fuel/repair facilities that accept MasterCard will accept the retail fuel card.